With Saint Patrick's Day fast approaching merchandise defaming the Irish is starting to appear in stores and online. There are undoubtedly some among us who may think drunken Irish merchandise and/or meme’s are funny or that we have become too politically correct and should not be so easily offended by such poor attempts at humor. We disagree. These things aren’t simply distasteful, they are defamatory. If it were any other race of people it would not be okay or funny. Nor is it okay or funny to perpetuate negative stereotypes of the Irish or any people. Negative stereotypes can do more than just offend. Did you know anti-Irish sentiment influenced America’s first immigration laws? Laws that are now at the forefront of the news. Laws that have in the past and continue to put the futures of thousands of Irish immigrants in limbo. And let’s not forget, “No Irish Need Apply”. It is on all of us to call out defamatory and discriminatory practices, products and posts, to educate on why it is wrong, and demand its stoppage and/or removal. Businesses and vendors are likely to have emails and social media accounts in addition to phone numbers and mailing addresses. Search online for contact and social media information. Post directly to their social media pages and/or post to your own page and tag them using their handle or page name, for example ours is @laohnys. Social media sites, such as Facebook and Twitter, also often have policies regarding offensive and discriminatory posts and procedures for reporting them. ​Whether you reach out in person, by phone, through the mail or online, remember to be respectful while explaining the situation and demanding action. If you’re adversarial they may stop listening. You can be assertive without being aggressive. 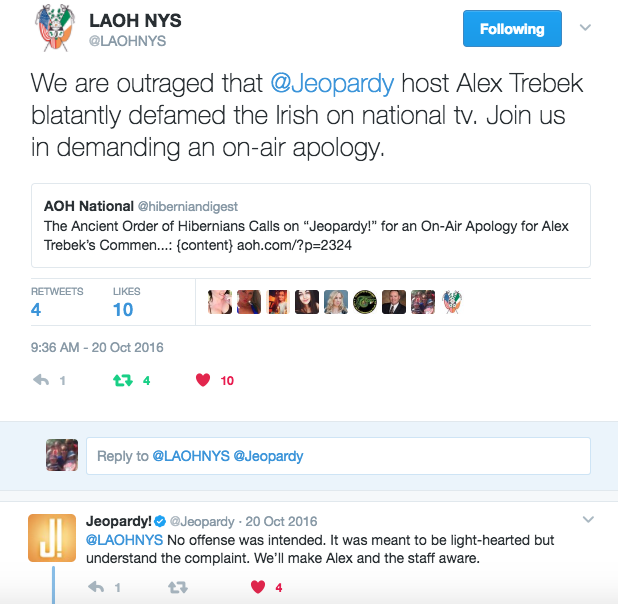 In the past we have stood up to Jeopardy! for airing defamatory remarks by calling, writing letters, and posting to their social media accounts. They heard us and apologized. In the past we have asked vendors to remove defamatory merchandise being sold at Hibernian events. Some vendors stopped selling the merchandise, others packed up all their merchandise and left the event. In the past people have bought up all the defamatory merchandise being sold by chainstores and returned it after the holiday. After several years one of the individual stores stopped selling it. Not everyone can put all that merchandise on a credit card and return it after it’s no longer profitable to sell at the store. But you can take all the items off the shelves and bring them to customer service or the registers, explain why they are defamatory and request they stop selling them. The store may put them back but before they are re-racked they are not available for purchase. You can also post product reviews on merchandise available online. Educate others who may be considering purchasing the items about why they shouldn’t and encourage the seller to remove the item. 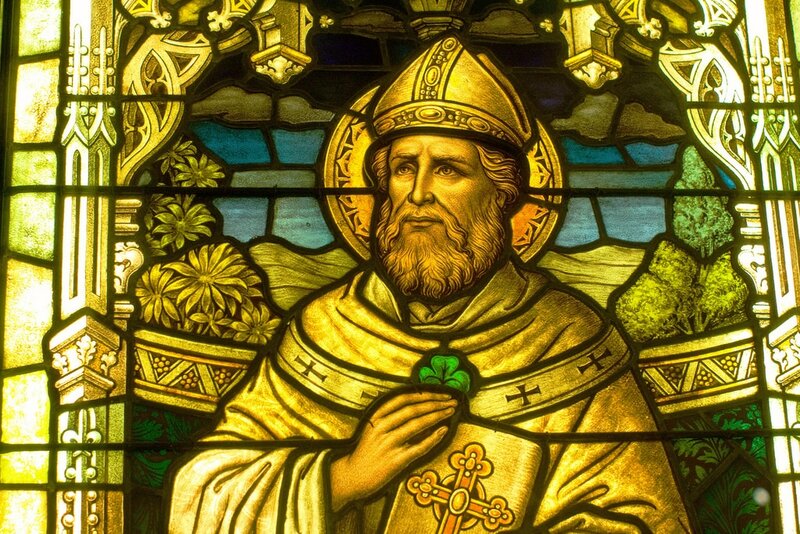 It is disheartening to have to fight every year against these opportunistic blatant displays of defamation at a time when we should be focused on preparing for St. Patrick’s Day, a holy and sacred day honoring St. Patrick, the patron Saint of Ireland. We are calling on each of you to stand-up for your heritage, for your Irish sisters and brothers, for yourself. Not just in the St. Patrick’s Day season but all year long. When you see negative stereotyping, defamation or discrimination in any form, speak up. Educate and advocate for a fair representation of the Irish people. As proud Irish-Americans this is our duty. On this Primary Day we are thinking about our sister from across the sea, Hanna Sheehy Skeffington, born in Ireland in 1877. In her lifetime Hanna worked tirelessly for women’s suffrage, for equal rights, and for Irish independence. Three components she believed were crucial to Irelands future. “Until the women of Ireland are free, the men will not achieve emancipation.” (Hanna Sheehy-Skeffington, 1909). Following the execution of her husband without trial during the 1916 Easter Rising Hanna travelled to America, under false papers having been forbidden to travel by the government, to gain support for the rights of Ireland to self-determination and to give an inside history of the Irish Rebellion. Her talk, “British Militarism as I Have Known It”, took her to over 250 venues around the United States, including Carnegie Hall in New York as well as an audience with then President Woodrow Wilson. Throughout her tour over $40,000 was raised for the cause of Irish Independence. After smuggling herself back into Ireland she was jailed briefly in England before being released and resuming her fight in her homeland. Hanna returned to the United States in 1922 to raise funds for the American Committee of Irish Republican Soldiers and Prisoners’ Dependents Fund. Watch the video above and explore the links below to learn more about the indelible Hanna Sheehy Skeffington. The following are the New York dates posted on Hanna's US Tour Facebook page. Please visit the tour Facebook page for the most up-to-date information or contact Joanna.McM﻿inn@gmail.com﻿ for further information. President Trump has decided to end DACA as it is now, within the next 6 months. This time will allow Congress to re-invent DACA as it stands. Deferred Action for Childhood Arrivals or DACA is an immigration policy founded by the Obama administration in 2012. DACA allows certain illegal immigrants who entered the country as minors to receive a renewable two year period of deferred action from deportation. It also allows them eligibility for a work permit. This program currently is protecting almost 800,000 undocumented immigrants from deportation. So, now we wait and hope that Congress makes the right decision to protect the Dreamers. Stay tuned. LAOH NYS is paperless. Information is distributed via email and documents are posted to the website in pdf format. The hotel does have wifi but be aware that high traffic can impact connection speeds. Make sure you have access to the information you need by printing or downloading documents before arriving to convention. PDF reader apps, such as Adobe Acrobat Reader, are available for most mobile devices. Remember to silence your mobile devices during events and if one goes off please refrain from calling out as this creates more of a disruption. Be an active participant. Listen with an open mind, take handouts, and keep notes. Review the final officers reports and proceedings from our last state convention, especially those pertaining to any breakout sessions you might attend. Check out the blog posts for Immigration Updates if you’re going to the Immigration & Legislation breakout session. We also have a post on Brexit & the Peace Process in Ireland if you’re thinking about attending the Brexit & Election Discussion on Friday. Update your passwords when you return home. ​Reflect on what you learned, what you liked and what you may approach differently at future events. Follow-up with connections and share your experiences. “Too many people make the mistake of thinking that a convention is over once they get home. You need to take advantage of the knowledge you obtained, the people that you met and the opportunities that presented themselves. This is the true value of a convention. (Agrawal, n.d.)"
No Division or County Board in NYS is to file a 990 or any form with the IRS. The State Board is completing everything. We all know the National Board had promised to complete and file the forms for tax year 2016. Unfortunately, a promise to file the report for 2016 was deemed meaningless by our current National President and Treasurer, without a vote by the National Board. Your New York State Board will honor the promise and insure compliance with the IRS for all NY divisions and county boards. You may hear that today the National Board advised each State Board that each Division must file with the IRS a 990 by May 15th. New York members PLEASE pay no attention to this. Although the National Board has chosen to forget the promise it made to the delegates at the National Convention, your New York State Board has taken action to make certain we all stay in compliance with all filings. New York State divisions and county boards do not have to take any action. Please thank our Sisters Jacqueline Clute, Kathryn M Keane and Christina Parisi for their help and guidance in this. ​Your State Board is working hard to help Divisions and County Boards. Your State Board honors its promises to its members! The revised Immigration policy is out. “Dreamers”, or those brought to the US as young children, will not be targeted unless they commit crimes. There are 11 million illegal immigrants here in America. 800,000 have committed crimes. These are the people who will be drawing attention. Our nation’s Immigration laws will be more aggressively enforced. Under the new directives, officials can by-pass due-process protections. Also, privacy protections to people who are not US citizens or green card holders will not be provided. “All of those present in violation of the Immigration laws may be subject to Immigration arrest, detention, and if found removable by final order, removed from the US,” according to a fact sheet released by the Department of Home Land Security. FYI, under President Obama, 2.4 million people were deported. Stay tuned. Ireland’s Minister for Foreign Affairs, Charlie Flanagan, has been monitoring the immigration changes in America. He has been in contact with the Embassy and the Consulates who in turn have been in contact with the immigration centers throughout the US. The H-1B Visas are issued to Irish citizens who are professionals looking to enter the US legally. Between 2010-2015, 3,200 H-1B visas were issued to Irish professionals. Changes to this Visa are being proposed by a CA congresswomen. She wants to raise the minimum income for these prospective H-1B visa employees to $130,000 annually. Also, an Executive order has been signed to limit funds to 140 Sanctuary Cities here in the US. On Thursday of this week, prior to the new administration, our State Attorney General issued guidance to local governments on how they can put laws and policies in place to limit their participation in Federal immigration enforcement activities that may come. Attorney General Eric Schneiderman, listed steps that include the following. Refusing to enforce non-judicial civil immigration warrants, denying requests from Federal officials to hold people in custody for more than 48 hours who have not been charged. Limit access to people already in custody. Limit the gathering and reporting of information like someone’s immigration status. This will be a fine line as to not cause distrust between law enforcement and the communities. Stay tuned.